In this paper, we study the effect of AC electric field on the onset of electrohydrodynamic instability in a viscoelastic fluid layer saturating a porous medium caused by dielectrophoretic force due to variation in the dielectric constant with temperature. Walters’ (model B’) fluid model is used to describe the behaviour of a viscoelastic dielectric fluid and for porous medium, Darcy model is employed. 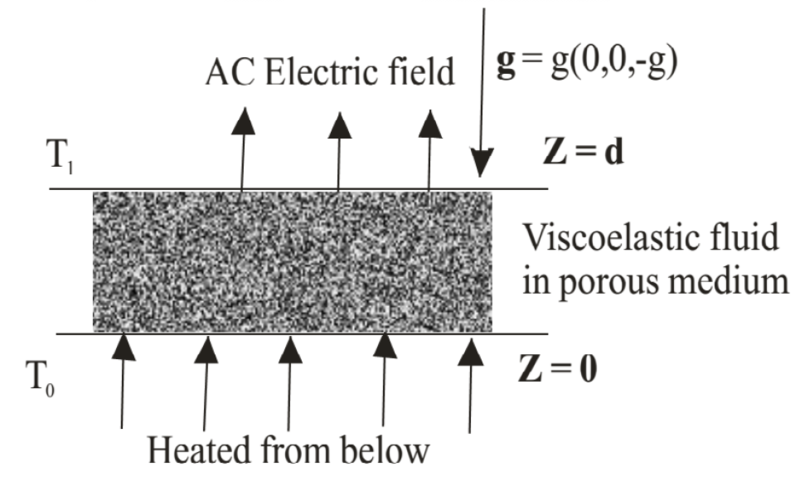 The fluid layer is induced by the dielectrophoretic force due to the variation of dielectric constant with temperature. We derive the dispersion relation describing the influence of viscoelasticity, Darcy number and AC electric field by applying linear stability theory and normal mode analysis method. It is observed that Walters’ (model B’) fluid behaves like an ordinary Newtonian fluid in the stationary convection whereas Darcy number and AC electric field have destabilizing effect on the stationary convection. The present results are in good agreement with the earlier published results. RANA, G. C.; CHAND, R.; SHARMA, V.. On the Onset of Instability of a Viscoelastic Fluid Saturating a Porous Medium in Electrohydrodynamics. Revista Cubana de Física, [S.l. ], v. 33, n. 2, p. 89-94, dec. 2016. ISSN 2224-7939. Available at: <http://revistacubanadefisica.org/index.php/rcf/article/view/RCF_32-02_089_2016>. Date accessed: 19 apr. 2019.